Some hangover sufferers struggle with a trip to the local shop, so we can only imagine how Fallout 76’s intrepid vault dweller feels. After waking in an empty vault following one heck of a party, they’re tasked with rebuilding and restoring West Virginia to its former glory, working alongside a group of other carefully selected individuals. Namely, yourself and your online buddies – this is Bethesda’s take on the shared-world online experience. An MMORPG this isn’t, however. 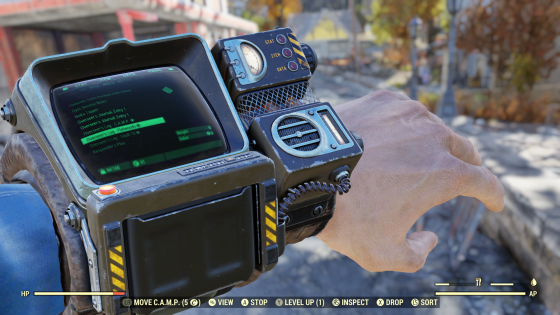 In fact, Fallout 76 doesn’t know what it wants to be, even borrowing a few ideas from the survival genre such as hunger and thirst meters. Allow us to pigeonhole it in a different way: if Fallout 76 was a party, it would be the ‘bring your own bottle’ kind. The host has provided the essentials, but it’s up to you to bring the fun and frolics. But wait! After an hour or so it starts to become apparent that Fallout 76 isn’t the most considerate or hospitable of party hosts. They keep kicking out guests, the snacks look out of date, the same music is played on repeat, and whether you’re having a good time or not is never even considered. You paid the entry fee, now it’s up to you to make the most of it by generating your own fun. If this isn’t the least appealing set-up for a shared-world online game, then we don’t know what is. Going into slightly more detail, Fallout 76 provides a colossal open world to explore, a list of quests and timed events to partake, a cubic tonne of junk to repurpose, and well…very little else. There’s no main quest – meaning there’s no drama, twist-filled, storyline to become engrossed in – and there are no NPCs aside the series’ trademark retro sci-fi robots. Following the nuclear fallout, they’ve been ordered to trundle West Virginia while awaiting your arrival. Like the omission of a storyline, the lack of NPCs also has a knock-on effect. The world feels empty, and the game as a whole feels incredibly soulless. Every building is deserted; every town is a ghost town. To use the party analogy for one last time, playing Fallout 76 is akin to turning up to a shindig beyond fashionably late. Everyone has left – all that’s left to do is clean up while the host shares a few embellished stories of what you missed. 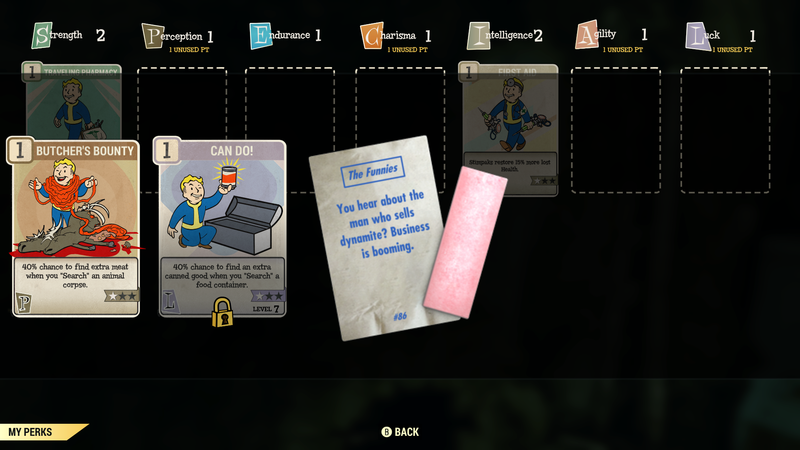 That’s to say, most of Fallout 76 is spent cleaning up other people’s mess – quite literally, given one mission involves collecting discarded beer bottles – while tracking down holotapes to listen to tales of living in a post-nuclear world. Missions are mostly of the ‘fetch quest’ variety – one includes collecting blood samples from foes, while another entails collecting dirty water from various sources – and a cookie crumb trail leading to Vault 76’s overseer to follow. For most part, though, you’re left to aimlessly wander. The best-case scenario is discovering one of the better, more interactive, missions (in the absence of quest-giving NPCs, simply strolling into a town triggers an event), or finding a building to explore and ransack for loot. This is very much a game that requests you find your own sense of purpose. The chance to replay a live event for an umpteenth time isn’t what we signed up for. Casually roaming the golden-brown countryside is mildly diverting, at the very least. In fact, it’s one of the few things Fallout 76 has going for it – with no major focal point, it has been reduced to its default status of being a sedate walking simulator. “Where shall we casually stroll to next?” we often asked ourselves. 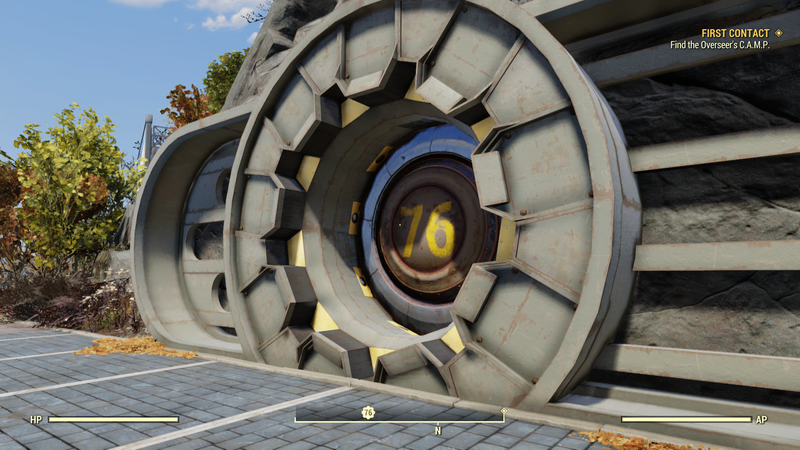 Pulling out the camera (Fallout 76 has a new photo mode), we’d often stop and take a few snaps while walking from one location to the next. There’s a picturesque ice cream parlour on top of a mountain, and a quaint tea-pot shaped café. It’s a shame the game isn’t more photogenic – the creaking engine is way past its best, even struggling to load textures in good time. It should be apparent by now that Fallout 76 has a lot of its fundamentals either stripped back or entirely removed. Problem is, the new additions fail to compensate for the omissions. The game world is now shared with other players, even when playing solo(! ), and so you’ll often see other vault dwellers working through the same quests as yourself, battling feral ghouls, the usual assortment of savage wild creatures, and the Scorched – a new race of trigger-happy mutants. It’s possible to team up and trade with others, which may sound both promising and inviting if it wasn’t for one simple thing: players can kill other players. You can probably already see where this is heading. Aside from becoming a ‘wanted man’ after committing a crime – be it for murdering another player or accidentally damaging their portable settlement – there is nothing in place to prevent a loose cannon killing innocent vault dwellers. We’d even go as far to say that the presence of achievements/trophies for killing certain amounts of players encourages PVP. So much for rebuilding America. The online structure causes issues elsewhere, some of which could have been avoided with a little more thought. Crafting plays a bigger part here, but as crafting tables can only be used by one player at a time you’re occasionally prompted to form a (dis)orderly queue. A trivial problem when compared to the next issue: the VATS targeting system has been removed entirely. Or to be more precise, it has been forcibly yanked. The gloriously grisly slow-mo targeting animations are no more, replaced with an utterly cack-handed auto-targeting system. It’s joyless, barely functional, and so sloppily implemented that the developers shouldn’t have even bothered. Target an enemy and most of the time you’re duly informed of a 95% chance of landing a hit. Often the only other percentage you’ll see is zero – reserved for when a foe is behind cover. It’s laughable. The aforementioned portable settlements, or C.A.M.P.S. as they’re known, feel equally half-baked. 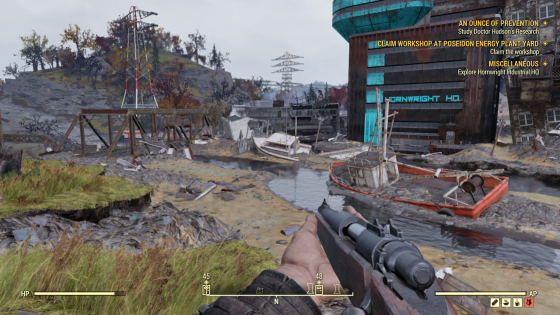 This is Fallout 76’s iteration of Fallout 4’s base building, minus NPCs to boss around and all sense of creative freedom. Camps must be placed in large open areas – which you may struggle to find in built-up or rugged locations – and before building the campsite of your dreams, items must be either unlocked or purchased from the microtransaction crammed ATOM storefront. Placing objects can be just as problematic as placing the camp itself, leading to minor frustration and sudden changes of plan. Only the patient will ever come close to creating a dream home, and even then they risk losing it all if any player wants to build their camp nearby. We found its best to keep things simple – a bed and a few crafting stations will suffice, recreated with ease. The new perk system fares better, being based on trading cards. The ‘free’ buff bestowing sticks of gum are an amusing touch. Cards fall into the usual bunch of categories (strength, intelligence, perception, etc) and duplicates can be doubled-up to improve the rank of a card, which adds a faint sense of progression. It is, however, very easy to overlook essential skills. We spent our first five hours roaming around with no lockpicking or hacking abilities, simply because we hadn’t been dealt those cards yet. It’s all down to the luck of the draw. Ultimately, Fallout 76 is a bizarre amalgamation of ideas and gameplay mechanics that never gel or operate harmoniously. At best it’s boring; at worst it’s broken. A jigsaw puzzle not just with missing pieces, but with pieces from different jigsaws that have been sledgehammered into place to form the ugliest of landscapes. A postcard of a ‘chocolate box’ tourist village that’s smeared with something you really hope is chocolate. 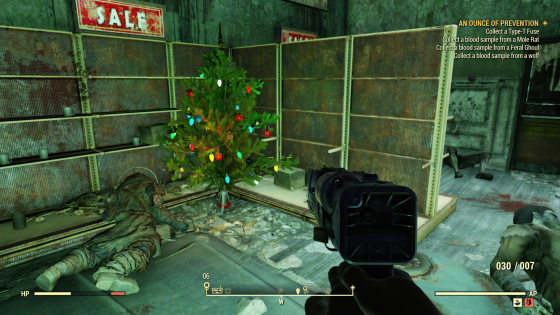 It’s hard to see how Bethesda can turn this failed experiment around. 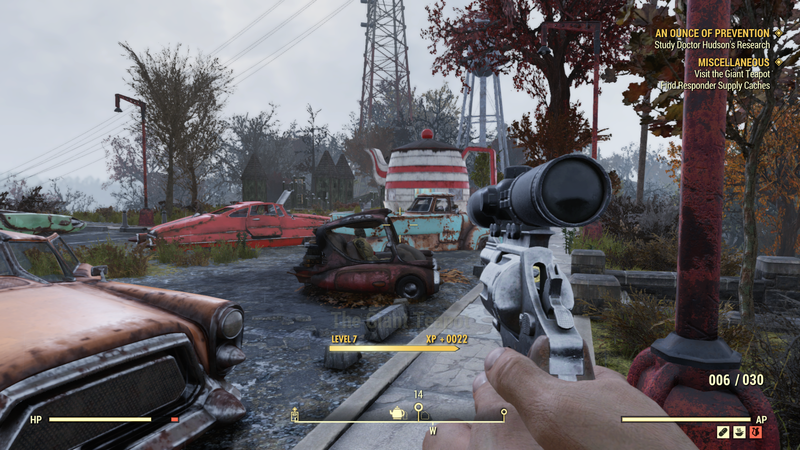 Introducing an offline mode reinstating VATS to its former glory would be a good place to start, but even that seems a tall order right now, and would ultimately only serve to correct a handful of Fallout 76’s inherent faults. Fallout’s future was once bright. The only thing that can save it now is to go back to basics and start anew. What a horrible, depressing, thing to say about one of gaming’s most cherished franchises.